It’s that time of year again: job-hunting season. Around this time, thousands of soon-to-be college grads nervously apply to thousands of job listings, hoping to lock down a sweet deal before they graduate in May. Now that it’s 2015, the days of uploading your resume as PDF are coming to an end. Employers want to see a candidate that really stands out. So, how exactly do you grab a HR’s attention in a pool of thousands of applicants? It’s time to show off your tech skills and go digital. Digital resumes and portfolios are the new standard, and can really push your application above and beyond the rest. 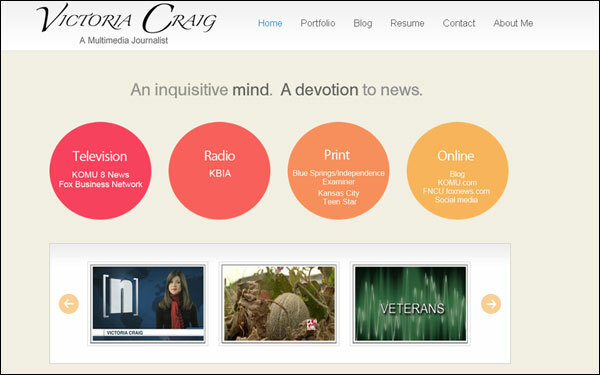 Creating a personal website like this shows employers that you know what you’re doing. You’re not just a college grad; you’re a college grad with skills ready for the workplace. The best way to learn is by example, and the Internet is overflowing with thousands of options to inspire you. If you have no idea what you want your site to look like (or you didn’t know you needed one until a few minutes ago), doing a little research is necessary to get those creative juices flowing. So get to Pinning—all your hours procrastinating on Pinterest have finally paid off. You can also do a simple Google search and find portfolios of professionals already working in your field. Definitely consider what industry you’re going into to determine what your portfolio should have. For example, if you’re bound for grad school in history, a simple and straightforward site is the way to go. But if you’re a future graphic designer, don’t hold back—this is the time to show potential employers everything you’ve got. If words like “Wix,” “Wordpress” or “widget” leave you feeling confused, you’ve got a little more research ahead of you. Choosing the right platform can make your life a thousand times easier when it comes to actually building your site. Sites like Squarespace or Wix are more user-friendly, while WordPress or Blogger the way to go if you’re more advanced and really want to customize your site. Unless you or your best friend is a graphic design major, consider the pre-made templates each one offers so you’re not stressing over hours of HTML codes. Do you love coffee and the color pink? Great—you’re already halfway to creating your unique brand. Branding isn’t just for companies and their product anymore. Having a unique brand makes you more memorable, and therefore increases your odds of getting the job. So, think about what makes you, you, and incorporate it into the design. Even your smallest personality quirks can humanize your site and really set you apart. While coffee is a great start, one of the most important parts of your personal brand is your skill set. This is a portfolio after all, so load it up with every accomplishment you’ve had in your college years. Even if your writing or design samples are lacking, there are plenty of ways to show off. If you managed social media accounts, link to those. If you volunteered at the hospital, include a link to the hospital and list all of the skills that you learned there. If you were the VP of the creative writing club, do the same. You have the skills and the experience, now’s the time to show it off. So we know you’ve probably heard the “keep it professional” lecture a thousand times during your college career but listen up again—it’s important. When creating a personal website, it’s easy to get a little too personal, especially if you’re incorporating a blog. Whenever you put something on the site, remember that your future employers can (and will!) read it. Every great site needs an about page with a short summary and a professional photo. Now is the time to get professional headshots. If your school doesn’t offer them for free, recruit a photography student who can use it in their portfolio. Also remember that professional doesn’t have to equal boring. You should let your personality shine and mention you love coffee, yoga and the color pink — just don’t get into all the dirty details of your spring break trip. While a great online portfolio can really help you, a terrible one can really hurt you. Professionalism is most important, but a clean and easy to read design shouldn’t be overlooked. If a recruiter gets to your site and can’t understand it, it’s not going to do you much good. Make sure links to your portfolio and about page are clearly visible. Don’t send recruiters on a manhunt around your site to try and get information about you. They don’t want to play games. If you’re not sure, have a friend of family member (someone who’s never seen the site before) test it out and give you their notes. Your site may look flawless in your eyes, but could be impossible to navigate for someone else. Turns out Instagram and Pinterest aren’t just ways to share what you had for lunch. Social media is actually a very important tool in building your brand and is developing into a networking secret weapon. That being said, it’s important to establish strong (yet 100 percent professional) personas on these outlets. Share articles and information relevant to your future field. You can even use it as a networking tool by following and engaging with big names in your profession. If you really want to jump into it, try out a Twitter chat. These are a great way to build a following, show off your knowledge and meet tons of prominent people. Who knows, you might even connect with your future boss. The blogosphere is a crowded place, but that doesn’t mean that your opinion shouldn’t be heard. Whether you’re a budding journalist or not, having a blog can show off your creativity and help you build some credibility with potential employers. It can even help you bring in a little extra cash. Emma, blogger of It’s Emma Elise, said, “I’ve landed multiple opportunities, like my job as a Spotify ambassador, because of my blog.” So really, the perks of blogging are endless. It might land you some free music right now and a job in the future. You wouldn’t submit a job application before making sure it’s perfect, right? The same goes for your website. You want your site to really blow the minds of your potential bosses, not make them question why you don’t know the different between “your” and “you’re.” Whatever you’ve decided to include, make sure it’s professional and proofread everything until it’s perfect. Let’s say you’re gradating in May, already applying for jobs and just don’t have the time to sit down and a build a site like this from scratch. We recently discovered an awesome tool called Recsy, that streamlines this whole process and makes your life a thousand times easier. “Recsy is a simple, fast, intuitive website builder that pulls from information students already have on their LinkedIn, to create and launch a beautifully responsive website instantly at <yourname>.com,” said co-founder and CMO Larissa May. So basically, this tool will do all the hard work, and leave you with an amazing professional site in minutes. , but you can sign up to try it out. OK, this last step might be easier said than done, but what we really mean is that it’s time to show off all your hard work. Make sure employers know that you have a webpage and that it’s going to rock their socks off. Mention it in your cover letter or better yet — create a professional e-mail signature with a link right to it. Then, sit back and wait for the job offers to roll in. We guarantee that recruiters will be impressed when the Google your name. If you already have an online portfolio you’re proud of, don’t be shy — share it with us in the comments, and help others get inspired.